These ancestral web cards were generated by Reunion family tree program for Macintosh. Information contained on the cards are a product of my input. Since inheriting my mother’s genealogy research in 1993, I have taken on the monumental task or organizing her decades of work researching the Shinabarger family. In fact, if you have a surname that is Shinabarger or one of its varieties of spellings, there is a excellent chance that you, your mother, grandmother, aunt or uncle once received a letter from my mother. Perhaps all of the above.I became so interested in my ancestry that I expanded research to include the paternal Bunyard side of my family. The result is the accumulation of over 20,000 names and 11,000 families in my Reunion database. 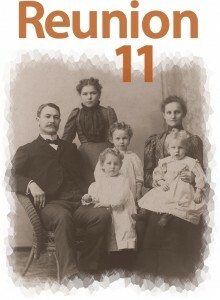 I have written The Shinabarger Family History compiled from the original research and my efforts over the last 20 years, a series of chapters on six generations of My Bunyard Family History, and compiled the 5 years of the 1968-1972 newsletter “The Dozen S’s” about the Shinabarger and other related spellings. But then I had a huge advantage by not having to start my research from scratch. 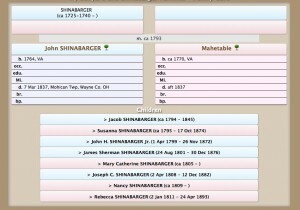 My future goal is to write the same generational history on the Shinabarger family beginning with “The Elusive Shinabarger Patriarch 1700-1764” and working my way through the following five generations. Using DNA results, I hope to include DNA information and projections. Firstly, I love history and placing my ancestor into a context that is more that names and dates is a fascinating endeavor. Secondly, it is my way to compile this information into one place. Thirdly, I hope that more eyes on the information might eventually lead to the unknown 17th century patriarchs of both the Bunyard and Shinabarger families. The world of Internet, Ancestry.com and DNA is a game changer. Having programs like Reunion in which to collect and publish data is exciting. Being able to carry that program with you, along with camera, scanner, photos and documents all on an iPad or smartphone is amazing. The wealth of information available grows each day. These resources provide a means to make this information available to others so the research may continue. Because of modern technology, researchers are not alone and some pair of eyes out there will find the connections we all seek. 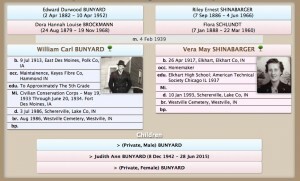 Click on BUNYARD REUNION CARDS to reach the Index for either the Bunyard or Shinabarger cards. Click on the central person’s name to generate a Person Sheet for that person. Sources are noted on the Person Sheet and you will be able to click on the numbered Reference to see the source. Click through each card to follow generations backward or forward. For multiple spouses, click on a number below the person’s card. Click on the Green Tree to generate a five generation family tree. Use the SURNAMES or INDEX to look for a particular surname. Click on CONTENTS to return to the Home Page. HOME CARD always goes to my parents William and Vera Shinabarger Bunyard. For allied spellings of the S’s variations, check SURNAMES or INDEX. Note entries in red or blue or bold. These represent questions, doubts, and suppositions on my part, a way to remind myself of further research needed, links to confirm or clues to possible links. All efforts are made to include accurate and documented information. However, there is no doubt that typos and errors were made. With my mother’s papers, correspondence and notes, it was impossible to find all the sources. USING THE SEARCH ENGINE AT THE TOP OF EACH CARD WILL WORK BEST FOR LOCATING YOUR PERSON OF INTEREST. Mrs. Harry (Mary Keel) Lundstrom of Indiana, great-granddaughter of Jacob Shinabarger and Hannah Heller. Mrs. Wilson C. (Marjorie) Carb, Jr., gr-gr-gr-granddaughter of Michael Shanabarger and Mary Long. Mrs. Arch (Wilfarene Lane) Henderson of Texas, great-granddaughter of Wm Shinaberry and Sisson Fisher. Mrs. Leland (Dorothy “Dot” Wiedenback) Shinaberry, gr-gr grandson of John Shinaberry and Ruth Yocum. Lily Shinabarger Jackson, great-granddaughter of Jacob Shinabarger and Hannah Heller. Mrs. Derrell (Florence “Flo” Paugh) Dyke of Marysville, VA, great-grandaughter of Elizabeth Shinaberry and Michael Davis. I invite you to contact me with any documented corrections, additional information or theories.